NEXT | The Queue: Why did I log on today? Okay, so you just hit level 70. You’re working on bounties — and yeah, I’m gonna do a post about them soon, I’m just one man — and you notice a ghostly fellow floating around your encampment, or perhaps a strange obelisk over to one side. And this is your first, not entirely well explained exposure to Nephalem Rifts, a form of content which basically distills Diablo 3 down to its utter essence. Nephalem Rifts and Greater Rifts basically take the whole notion of story and plot and dispense with them entirely — they say You’re here to fight and kill monsters and gather sweet, sweet loot and they just focus on that. You don’t have to wander the world doing tasks for Tyrael, you don’t have to go back and replay the story from either the main game or Reaper of Souls, you simply go up to Orek or the monolith in camp to start the Rift. Nephalem Rifts are part of Adventure Mode, but rather than go across the map of each act of the game and performing various tasks, you can simply walk up to Orek and start a Nephalem Rift by talking to him. He tells you that the ancient Nephalem used to have him open such Rifts for them to go fight waves after waves of foes, because apparently the ancient Nephalem were big X-Men fans and/or Star Trek The Next Generation fans but couldn’t think of another use for a holodeck besides fighting armies of demons. 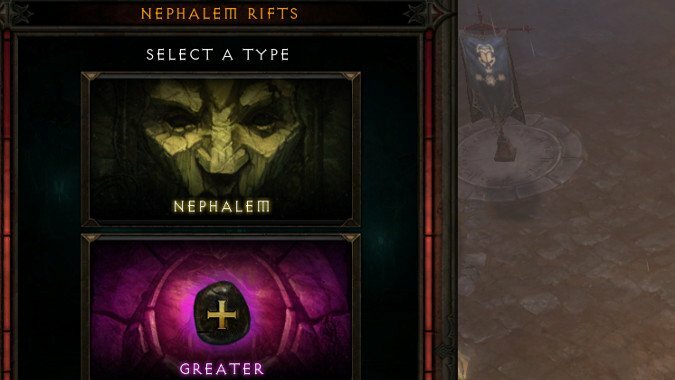 There are two types of Rift — standard Nephalem Rifts, which are locked to your Torment level (so the harder your Torment level is, the harder they are) and Greater Rifts, which can be manually scaled. 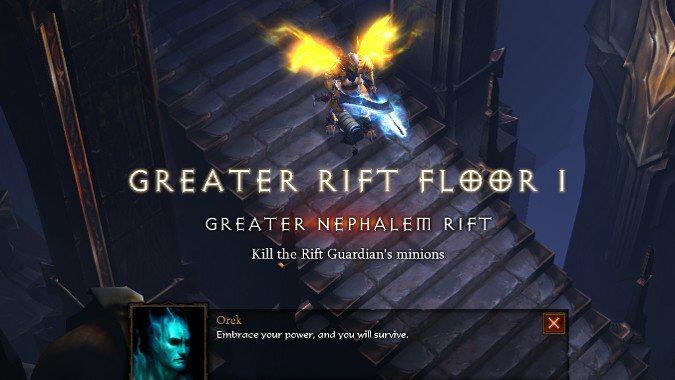 Greater Rifts require keystones earned by completing regular Nephalem Rifts, so if you want to do a lot of Greater Rifts you’ll have to run at least one Nephalem Rift. Nephalem Rifts are pretty straightforward — you talk to Orek, select Nephalem Rifts and trigger the Nephalem Monolith, which opens a yellow portal. You can then step through the portal and slay enemies to your heart’s content. Slain enemies drop orbs that fill a bar, and when that bar is filled, you will summon a Rift Guardian, essentially the end-boss of the Rift. You can summon the Rift Guardian while you’re surrounded by other monsters so be careful, but once you kill him he drops the Keystones you’ll need for Greater Rifts. It’s important to note that monsters in Nephalem Rifts drop loot. Often, they drop a lot of loot, and you’ll have to Town Portal back to identify and either stash or break down that loot before heading back into the Rift. The Rift Guardian often drops a good deal of loot as well, and you can even run into Treasure Goblins and even have a Treasure Goblin or Rainbow Goblin open a portal while you’re in there. You might want to finish the Rift and kill the Rift Guardian before you teleport to the Treasure Realm or Whimsydale if that happens. Don’t worry about how long you take to mess around in town before you head back in. The Rifts only close after you talk to Orek again once you defeat the Rift Guardian, and he’ll give you a bit of gold and XP for your trouble. 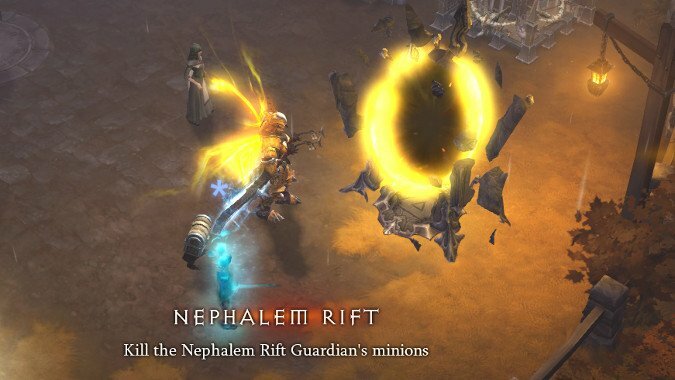 Greater Rifts tweak the formula for Nephalem Rifts in several key ways. First up, nothing but the Rift Guardian drops loot in a Greater Rift, so you don’t have to worry about looting at all. That’s good, because stopping to loot would slow you down, and in order to successfully complete a Greater Rift you have to beat the timer. Like normal Nephalem Rifts, there’s a Rift Guardian you have to slay in order to complete a Greater Rift, but there’s now a timer you have to beat while filling the bar to summon said Rift Guardian — fail to summon and kill the Rift Guardian before the timer runs out, and you get nothing. No money, no loot, and no place on the leaderboards. It’s not all bad — successfully killing a lot of monsters very quickly will push that bar up and give you plenty of time. Look for the purple orbs to help push the bar up faster and summon the Rift Guardian before the end of the timer. Succeed in doing this, and the Rift Guardian will drop loot, which scales up with the difficulty of the Greater Rift — the higher level the GR, the more loot the Rift Guardian will drop. GR farming is an excellent way to get Ancient Legendaries once you’re at or above GR 35 or so, and once you complete a level 70 GR solo you unlock the chance for any Ancient Legendary to drop as a Primal Ancient Legendary, with perfect stats for that item. But the chance isn’t big, so don’t go expecting that you’ll get a lot of them from a few GR’s — if you’re looking to be head to toe in Primal Ancient Legendaries, you’re going to need to run a lot of higher level GR’s. Greater Rifts are progressive in difficulty — rather than being locked to your Torment level, they’re adjustable before you start them, with each level from corresponding roughly to a Torment level. 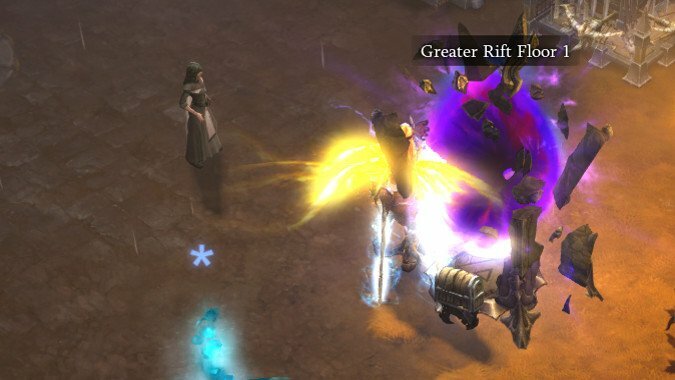 Greater Rift level 60, for example, is roughly as hard as Torment XIII, with further ranks in GR’s being harder still. Greater Rifts are the only place to get Legendary Gems in Diablo 3 except for the one that drops in the Treasure Realm, the Boon of the Hoarder. Legendary Gems can also be leveled up to a higher level at the end of a completed Greater Rift — the higher level the GR, the more chance Urshi can increase the level of your Legendary Gem. So what should you do with Rifts? I’d start running Nephalem Rifts as soon as you find a Torment level you’re comfortable with — they’re excellent sources of loot and gold. Greater Rifts you should probably hold off on until you’re at least comfortable pushing Torment IV or higher, because that way you’ll build up a steady supply of Keystones and will be able to run a few Greaters in a row at the difficulty level you’re comfortable playing at. As your gear increases and your Paragon levels get higher you can push higher level GR’s for better gear, with the ultimate goal of clearing GR 70 successfully in order to unlock the chance for a Primal Ancient Legendary item to drop. Nephalem Rifts are perfect if you’re not feeling motivated to complete Bounties for whatever reason, as a supplement to Bounties or a straight up replacement for them. I often run two or three Nephalem Rifts and a Greater to ensure that my supply of Keystones stays well within my comfort level. Remember, you can always spend gold to run an Empowered Greater Rift, which adds an extra chance to upgrade a Legendary Gem when completing the Rift. Since GR’s are the only way to get and upgrade Legendary Gems, it’s worth running one to get one you don’t already have or upgrade those you do. Remember, for players new to Diablo, this isn’t some exotic new thing. At its heart, it’s exactly what you’ve been doing all along — killing waves of monsters and taking their stuff. It’s just stripped down without the narrative elements, presented as a simply monster buffet for you to indulge in to your heart’s content. If you want to do nothing but farm Rifts? You can. Farm Greater Rifts? All you need are enough Keystones from Nephalem Rifts and you can run Greater until your bloodlust and avarice for treasure are truly sated.